Home » Blog Timeline » Managing Stress » Are You Feeling Stressed or Focused? I got a distressing phone call from a friend on Saturday of this weekend and it left me in a painful awareness of the reality of the choices facing so many of us today. My friend Linda called me on Saturday morning. “My life is falling apart and I don’t know what I’m going to do…” She burst out in tears as she explained what had just happened. I was stunned and speechless as she described her situation. I had known her for 6 years and from the outside…her life seemed perfect. She and her husband had everything going for them. But what I couldn’t see were the small compromises that were made along the way…that led to their situation today. Tom and Linda were budding professionals in a fortune 500 company. They had 3 children ages 5, 7, and 12. Both of their jobs were demanding and often their schedules were filled with back-to-back meetings and tight deadlines and deliverables. By the time they got home…they were drained, their stress levels were high and neither had the strength to deal with anything more. But, they would take a deep breath and work together to get the children fed, homework done, baths drawn and would read them a story or enjoy a TV program before they put them to bed at 9pm. Then, they might have a glass of wine together before they jumped on their computers to finish emails, presentations or other work they did not get a chance to do during the day. Many nights they would go to bed after midnight. When they woke up in the morning they felt tried, but they would rush around getting the children ready, making breakfast, confirm who’s doing what, get the kids on the bus and then hug each other and off to work they would go. The weekends were no less busy… often filled with sports activities, ballet or dance lessons, yard work, grocery shopping, laundry, birthday parties…and let’s not forget the household chores. This was Tom & Linda’s life for years and years…they quickly got overwhelmed with their duties in life. The sweetness they once felt was replaced by the battle of competing priorities and getting things done. Over time, they began to lose sight of what was important in life. Both Linda & Tom were consistently feeling low grades of anxiety from the stress of their jobs & life, but neither knew what it was and what to do about it. They were impatient and on edge at work, with each other and with the kids. There was mild (but consistent) conflict, upsets and discourse that did not get addressed. It became hard to be around others without getting annoyed, judgmental or short. There was no time to honestly talk things out. Then through the course of this year, the unimaginable happened. · Tom had a stroke at forty-seven and as a result was paralyzed on the left side of his body. The doctors said he might make a full recovery…but the process would take time and physical therapy. · The oldest child was arrested for possession of marijuana while cutting school. · The middle child brought home failing grades and a need for attending summer school. · The company Linda worked for announced a 10% workforce reduction. · And, if that was not enough, the youngest child went into a mild depression due to the things going on in the family. “How did we get to this point?” Linda asked….I remained silent for a few moments. “I’m not sure” I said. I know a lot of people are in the same situation to varying degrees. Part of the answer is that we don’t realize the small compromises we make on a daily basis until we see the impact of our choices play out down the road. But the good news is that we can change our trajectory by making a few simple changes. This 10 second speech by Bryan Dyson – Former CEO of Coca Cola resonated with me as I thought about Linda’s situation…. “Imagine life as a game in which you are juggling some five balls in the air. They are Work, Family, Health, Friends and Spirit and you’re keeping all of these balls in the air. You will soon understand that work is a rubber ball. If you drop it, it will bounce back. But the other four Balls – Family, Health, Friends and Spirit – are made of glass. If you drop one of these, they will be irrevocably scuffed, marked, nicked, damaged or even shattered. Work efficiently during office hours and leave on time. Give the required time to your family, friends & have proper rest. I sent the above quote by Bryan Dyson to Linda and we talked again Sunday morning. I reminded her by saying, “All is not lost, Linda, a few balls may have dropped, but they have not shattered. You can turn this thing around and make new choices”. We discussed several options and Linda now has a path in moving forward. Many of the things I shared with her are out of two modules that we have in a Transformation program that we have just released. The first module is titled Tame the Brain and the second is Living an Unhurried Life. Tame the Brain teaches individuals how they can stay balanced and centered as they deal with stress, overwhelmedness and low grade anxiety. 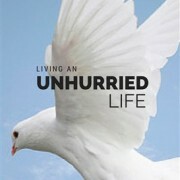 Living an Unhurried Life teaches individuals on how to stay balanced by living in an intentional way and focusing on what is important. If you are interested in learning more about these modules, please click on the icons below. Share this article with family and friends in support of Stress Awareness Month…and their health & wellbeing. Everyone can use a reminder. I know Linda’s story brought it home for me. I realized after talking to her…it’s time to make some simple adjustments. Are you Feeling Stressed & Hurried or Steady & Focused? And what are you doing about it?